An earthquake is when the earth shakes. 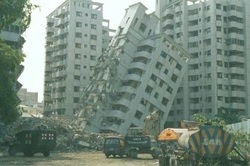 Most of the time earthquakes can and will cause damage. Most earthquakes happen when the Earth's tectonic plates shift and move around. Tectonic plates move in all directions and at different speeds. Two plates can push toward each other or pull away from each other. They can also slowly slide past each other at different speeds. Most earthquakes occur near a fault, which is a break in the Earth's crust, because of the sliding. There are three different types of plate movement. The first one is transform, which is when two plates slip past each other. The second one is convergent, which is when the plates push together. The last one is divergent, which is when the plats separate from one another. Seismologists measure earthquakes by using a seismograph. The waves created are plotted on a seismogram.